Probably, no other place in the world could compare to the spectacular scenery of Sapa. Sapa, the Kingdom of beautiful, luscious landscapes, sits regally overlooking beautiful valleys , lofty mountains towering over the town all sides. Furhter more, Sapa is the gateway to another world of mysterious minority cultures. It is home to a great diversity of ethnic minority people who do not pay attention to how rich or poor they are, the most important is how to enjoy their life. Most of them work their land on slopping terraces because almost of the land is mountainous. Join Sapa tours in Vietnam luxury travel style just one time, remember all your life. bestselling of sapa tours: "discover sapa - natural wonder"
bestselling - sapa tours: "discover natural paradise on earth"
So peaceful and beautiful that you can speak and listen to the nature. 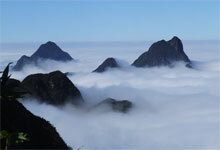 The wonderful point of Sapa tours helps you talk to the nature through your eyes(5days/4nights). Hard adventure. Trekking to the top of Indochina - 3,143m. Great experience on mountain climbing. Commitment to excellence and satisfaction. Join Sapa tours just one time to remember Vietnam vacation all your life.